After farming for more than 20 years, Kurt Timmermeister is still working on his vision of a farm–working to get rid of it, that is, and replace it with the reality in front of him. Mother Nature doesn’t love us! She doesn’t glow with pride when we try to do the right thing, she doesn’t catch our arm before we tumble off the ledge, and she certainly doesn’t write us a little check for a do-over when we screw up. Oh well. Last Thursday, in the second of Seattle Arts & Lectures’ series of talks on the culture and politics of sustenance, former restauranteur and current cheesemaker Kurt Timmermeister took us on a tour of his twenty-year wrestling match with Mother Nature. Twenty years ago, seeking a calmer life closer to the soil, Kurt found a house he could afford on Vashon island–four acres of brambles with a converted chicken coop for shelter. Later, he added an adjacent 13-acre parcel with the additional amenities of decades of buried industrial detritus and garbage from the old Beall Greenhouses operation. But that’s not what Kurt saw; instead, he had a vision of a farm. You might recognize it (you might even share it! ): a few sheep, some chickens scratching in the yard, maybe a couple of ducks, a bunny or two, some goats, cows of course, an orderly and verdant vegetable garden, and ranks of gnarled fruit trees in an orchard. Now, twenty years later, 90% of it is gone, and he is down to one or two things that he can actually do. He has Jersey cows and he makes a cheese (Dinah’s, a soft bloomy rind cheese). In a year and a half or so, he will offer a second cheese. So what happened? Well, let’s start with that orchard. He wanted apple trees, to make hard cider. He ordered about 200–”very fussy trees; the more obscure the better I liked them.” The plan was to plant them, wait five years, and be all set to go. But one morning he went out to discover that the first tree had no leaves. The next one?–no leaves. The deer had come through and in one night destroyed his trees. He re-planted. They did it again. They stepped casually around his really scary scarecrow and kept munching. “My idea was, I was good. I took the land and made it better. The deer should respect that! Why are these deer against me?” Well, say hello to the power of nature. 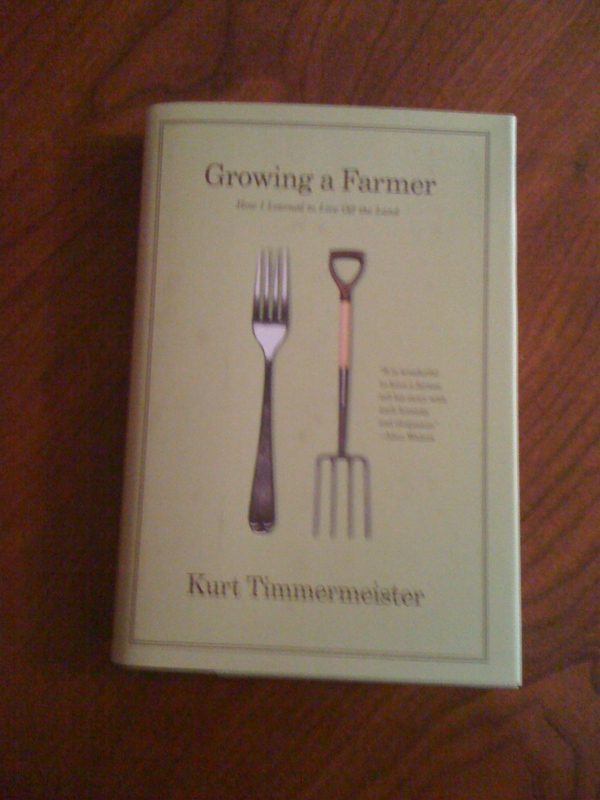 Even living there on the farm, Kurt says, he still doesn’t fully understand where food comes from. We go out to buy food, and we can have anything we want, all year round; it’s really hard to know what’s seasonal and local, or what goes into producing it. We eat meat, and so somebody slaughters animals; we need to know this and accept it–but it’s hard to get next to the reality of it. He points out that he himself has never seen a cattle slaughterhouse; in fact, he’s seen only two commercial dairy operations (not pretty, by the way). Why does this disconnect matter? “It’s food. It’s vital,” he says. It keeps us alive; we should want the very best. But it is really hard to make food. What’s worse, small farmers have to compete on pricing with large agri-business operations. Their advantage is that you can go out, shake their hand, and poke around their operation. You can see how they do things and talk to them about ways to do things better. But if you want this kind of personal relationship with your food providers, you have to pay them a price that allows them to pay for their farm and live reasonably–send a kid to college, hire some help. Replace the fridge. Have a nice bottle of wine. Have the kid see a future in coming home after college to run the place. This is the only way that small farming is truly sustainable, Kurt says.